Day 2 of detail-are you ready?? Here we go!!! Card base here is Not Quite Navy with a layer of Crumb Cake behind a First Edition DSP layer. This DSP is still available btw, even though it was in the Occasions Mini. It's on the Carry Over list!! I used my Classic Stars wheel in Baja Breeze across the DSP. The main image was done with the Acetate and Tissue Technique. You need Acetate, glue, reinkers and tissue paper. The basic process: stamp your image in Stazon on the Acetate. When dry, turn it over and apply glue completely over the back, then add reinkers. When you have the color as desired, add a couple pieces of tissue for the crinkled look. Let dry. Now, I varied this just a little. My glue (Mono Liquid Glue) was almost empty and somewhat dry. It wasn't giving me the look I wanted, so I grabbed my Crystal Effects instead. It probably takes longer to dry, but I really like the result. Next variation: the basic technique just blends colors into the glue randomly. 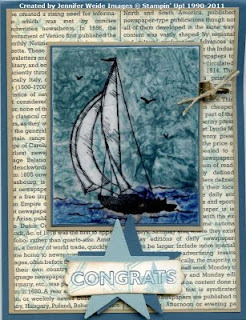 I placed mine in certain locations: Whisper White Craft on the sails, Baja Breeze on the Sky, Not Quite Navy on the sea, and Crumb Cake on the boat. NOTE: there is risk of bleeding and colors straying outside the lines! I recommend staying away from the outside lines on the images. When you apply the tissue it will push the color closer. Let me know if you have additional questions on this. My suggestion if you're not familiar with this technique: sit down and try one! Maybe with random colors first to see the concept, then with color placement. I would NOT try this with a very detailed stamp!! It is messy too-get some scratch paper to work on!! When dry the image was layered onto Not Quite Navy and Crumb Cake. I added the Mini Library Clip to the side before attaching. It has a piece of Linen Thread tied around it. The saying is from the Happy Greetings set, also in the Summer Mini. I used my Not Quite Navy marker to ink just the 'Congrats' from the center of the stamp. I stamped it on Whisper White Card Stock and punched out with the Modern Label punch. I ran the star wheel over it too for accent and sponged the edge with Crumb Cake. The saying is attached to two punched stars, Baja Breeze first then not Quite Navy. The whole element is attached with dimensionals. 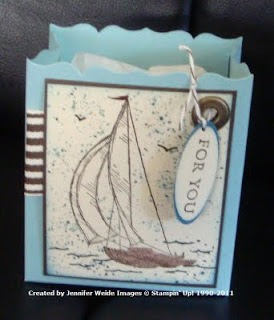 I used my Fancy Favor die to cut the box out of Baja Breeze textured card stock. It's very easy to assemble with a little sticky strip! 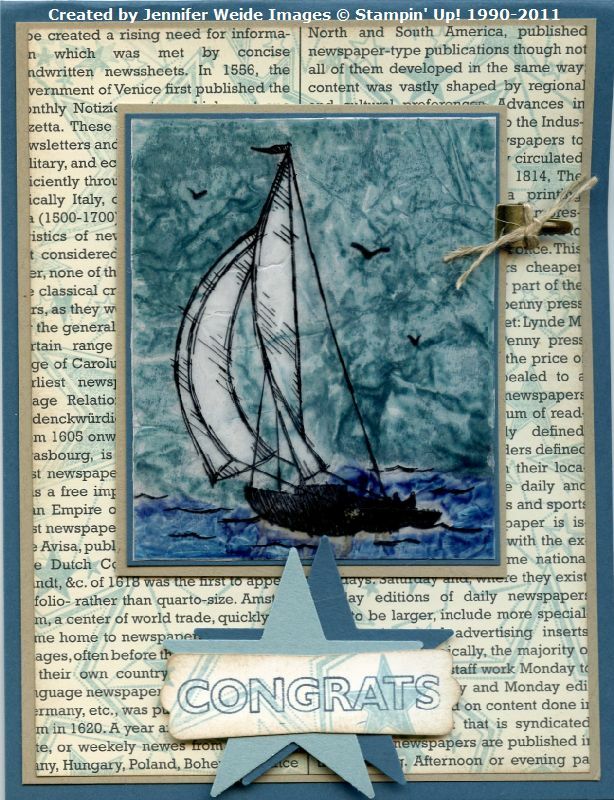 I stamped the boat in Early Espresso on Naturals Ivory card stock. I masked the sails and bot and spritzed the image with Baja Breeze (mostly at the top for sky) and Not Quite Navy (mostly for the ocean). I sponged the edges with the Baja Breeze for the sky and Not Quite Navy for the sea then layered onto Early Espresso. I attached a piece of folded Early Espresso ribbon at the side as I attached the image to the box. I discovered that point I really didn't have room to attach a saying-I didn't like the way anything looked. So, I grabbed a jumbo eyelet, used my Crop-a-Dile to punch the hole and set the eyelet, and tied the saying on with Espresso Baker's Twine. Thanks to all who stopped by during the hop, left comments or became a follower!! I hope you'll keep coming back for inspiration!! Knowing you all are out there keeps me stamping! !